It is August 10, 2012, and Tammy Smith '86 is making history. Yet, despite her excitement, she is in military mode. Twenty-five years in the army have conditioned her to stay calm, alert, focused. More than 150 people have come to witness her promotion ceremony at the Women in Military Service for America Memorial at Arlington National Cemetery in Washington, D.C. Smith listens to the national anthem and the Pledge of Allegiance. Her boss, Lieutenant General Jack C. Stultz, delivers a speech. "It's a great day for the army," he says, as Smith stands next to him on the stage, gazing out at the audience of friends, family, and colleagues. "We're here to celebrate a quiet professional who has proven over and over again that she has the abilities, the skills, everything it takes to be a great officer in the army." The promotion order is read, and Smith stands tall while her wife, Tracey Hepner, and her father, Jack Smith, remove the shoulder insignia from her blue uniform coat. When Hepner pins on the star signifying Smith's new rank—brigadier general—she makes sure it is positioned correctly. Just for a split second, she rests her hand on Smith's shoulder. No one can take this moment away from us, she thinks. Applause erupts and Smith smiles, looking first to Hepner, then to her father. She takes off her coat and approaches Hepner's parents, Gayle and Ray, in the front row of the audience. Smith kneels down so Gayle, in a wheelchair, can replace the colonel's insignia on her shirt with the new general's star. There's nothing special about such family involvement in the pinning ceremony. Nevertheless, this family is making history. Tammy Smith has just become the first gay general officer to serve openly in the United States military. "No one gets to stand behind this podium without help from others," Smith says in her speech. "We don't get here alone." She talks about her parents and how their example taught her the value of serving the community. She talks about the Future Farmers of America (FFA) advisor who told her, "Anything worth dreaming for is worth working for." She talks about army superiors who encouraged her, and military women who paved the way. "I stand on the shoulders of giants," she says. It isn't until the next day that she realizes she hadn't mentioned Hepner in her remarks. After so many years under "don't ask, don't tell," when keeping her military and private lives apart was paramount, she now had to retrain herself. The policy had been in place for most of Smith's career. It meant that she, unlike many soldiers who preceded her, was safe from persecution for her sexual orientation—as long as she kept it a secret. In 1993, when President Bill Clinton introduced the measure as a compromise between upholding a ban on gays in the military and a repeal thereof, Smith had considered it a victory. Gay rights activists, however, continued to point out the discrimination inherent in the policy. Public opinion began to shift, and eventually even military leaders would no longer defend the policy's main claim that the presence of gays and lesbians in the military "would create an unacceptable risk to the high standards of morale, good order and discipline, and unit cohesion that are the essence of military capability." In December 2010, Congress passed a bill to repeal "don't ask, don't tell," and the policy officially ended on September 20, 2011, less than a year before Smith and Hepner stood together on that stage. 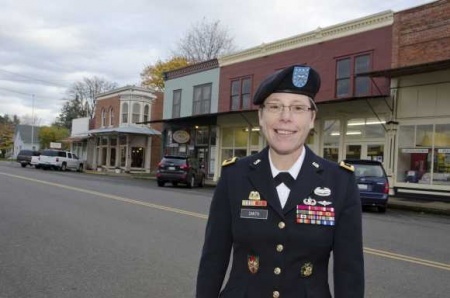 Three months after her promotion ceremony, Smith is back in her hometown: Oakland, Oregon, a community of about 1,000 residents an hour or so south of Eugene. Mayor Bette Kheeley and other community leaders have gathered at Tolly's restaurant, a local landmark, to welcome one of the tiny town's most successful daughters, a quiet girl who made it big in the world. Tolly's is not a place lacking in decoration. On this chilly day in November, the usual mix of vintage soft drink signs and antique furniture has been joined by balloons, flags, and all things red, white, and blue. When Smith enters the room accompanied by her father and her wife, air force veteran James Horton is among the first to greet her. Now commander of the local Veterans of Foreign Wars, Horton served in Vietnam, Thailand, and England over the course of a military career spanning more than 23 years. "Congratulations to you. You look good with this one," he tells her, pointing to the star on her shoulder. "Thank you. I appreciate it." "Next time I see you, maybe you will have two stars." "You're putting a lot of pressure on me." "Yeah, but you can take it." Jack Smith watches proudly as his daughter works the room. Seeing her grow up, he always thought she was a thinker, not a pusher. He remembers when she would get up at 5:00 in the morning to practice shot put or another sport before going to school. Or when her commitment to seeing projects through to the end extended to breeding rabbits—even when it came time to kill them, skin them, and sell them, all of which she did matter-of-factly. As excited as he is to see his daughter promoted, he is also concerned. Having served in the navy, he has seen what gay-bashing looks like. But here at Tolly's, Jack Smith pushes these somber thoughts aside and relishes the warm welcome the town extends to his daughter—and her partner. "I'm very fond of Tracey," he says. After receiving congratulations from old friends and members of the city council, Smith steps up to give a toast. "It's just so wonderful that you guys came out tonight to greet me here in my hometown. I can't tell you how much I appreciate that," she says. "While you thank me for my service, I have to thank you, because it's the family support, the families that actually make it possible for the military members to go do their job." She looks at Hepner. "And I appreciate Tracey's support so much." Thanks to FFA vocational classes, Smith knew how to weld, how to run a table saw, and how to talk authoritatively about dairy cows. But even though she had participated in leadership and public speaking activities in high school, she found herself unprepared for the rigors of higher education. She's the first to admit that she wasn't a particularly good student, and her goal of gaining admission to the UO's School of Journalism and Communication proved elusive. There was also disagreement in the ROTC cadre about her potential in the army. Smith was athletic, she liked the leadership aspects of ROTC, and she had no problems adjusting to military culture. But for some, she was not aggressive enough. Others argued that her leadership style was just different. As Smith sees it, she barely made it over the finish line—but she was determined, and finish she did, with a BS in history and a job waiting for her. "I finished on time," she says. "I was going into the army. I was proud of that." Smith had enrolled at the UO in 1982, one of only two women in her ROTC class. It was just two years after the first female cadets had graduated from the United States Military Academy at West Point. It was also the year the Department of Defense first issued a directive banning homosexuals from the military, stating: "Homosexuality is incompatible with military service." Because of this policy, some faculty members at the University of Oregon launched an initiative to remove the ROTC program from campus. The Department of Military Science fought this initiative and was looking for an eloquent student to write a letter in support of the program. They turned to Smith. Even today she is baffled that she helped defend a policy that forced her to live a double life—at great emotional cost. It was in her freshman year at college that Smith learned to keep her personal life separate from her life in the army. The summer before, while traveling with a carnival to earn some money, she had met a woman dressing like a man. "I was so intrigued by that," she would later recall. "It got me thinking: Wait a minute, what are other options?" She attended meetings of a campus support group for gay and lesbian students, where she found herself surrounded by people who, like her, were coming to terms with their sexual orientation and the societal discrimination surrounding it. She didn't feel she was struggling, particularly, but she knew she had to be alert. "I knew then that even though I was okay with it, this wasn't something that I should be public about." Being exposed would mean losing her scholarship. And yet, when Smith went to basic training at Fort Lee, Virginia, after graduating from the UO in 1986, she found that secrecy also bred community—an underground culture with particular rules. You didn't out other people. Officers and enlisted soldiers supported each other. Back at work, however, you made up cover stories to hide your private life. And so began what Smith would later describe as a compartmentalized life. She committed herself fully to a career in the military—a career she loved—with the knowledge that she was accepting a risk. She had a military world and she had a private world. These worlds did not cross. In the army, Smith gained a reputation as a true soldier, quiet but determined. She had made it through ROTC when the army was just beginning to integrate women. As she built her career, she ran warehouse operations in Panama and Costa Rica, where little resembled her small-town upbringing in Oakland. She jumped out of airplanes and became jumpmaster as soon as combat units began accepting women. A logistics expert with the army, she earned two master's degrees—an MA in management from Webster University and a master of strategic studies from the United States Army War College—and was progressing toward a PhD in management and organizational leadership from the University of Phoenix. She worked at the Pentagon, the bastion of military power. As her career progressed, Smith kept her guard up, never revealing details of her private life at work. On vacation, however, she welcomed the chance to relax. She enjoyed travel, booking cruises and tours with Olivia, the leading lesbian travel agency, which knew how to protect the privacy of its customers. While on a cruise in the Caribbean in 2004, Smith, as usual, found herself gravitating toward the cultural excursions rather than hanging out on the beach. She kept running into an attractive and sophisticated woman from Cleveland, Ohio, who seemed to share her interests. Her name was Tracey Hepner, and she and Smith kept in touch after the cruise, beginning a long-distance relationship. Every night, Smith called Hepner at 9:01—when the minutes were free. Sometimes they'd just check in with each other; sometimes they'd talk for hours. They still traveled with Olivia, one of the few places where they didn't have to worry about Smith being exposed. Two years into their relationship, they knew they'd stay together. Hepner, who had been working in her family's business selling air filters in Cleveland, moved in with Smith in Washington, D.C. She found a job as a behavioral detection officer with the Transport Security Administration at Reagan National Airport. Still, "don't ask, don't tell" cast a shadow over them. Hepner didn't tell her coworkers about her private life, because being out could put Smith, who had been promoted to colonel in 2008, at risk. And danger loomed everywhere. The couple would be walking down a street or shopping at a grocery store and hear someone say, "Hi ma'am." Without looking, Hepner would peel off and change direction. She knew she had to disappear when Smith was greeted by military personnel. After more than two decades in the army, Smith had perfected strategies to keep her two lives apart. But the wall was beginning to crumble. She didn't want to hide Hepner, who was such a significant part of her life. Yet, when she went to work, she had to pretend Hepner—her support system, the one who made her a better person and a better soldier—didn't exist. Smith—who had always been the fighter, the one who saw things through to the end—felt miserable, defeated. She was sick of keeping up the charade. No longer did she want to be a part of the army if that meant hiding the person she loved. Smith made a heartbreaking decision: more than two decades after completing ROTC training at the UO, after dedicating her life to the army, she put in her retirement papers. She started leaving her apartment in civilian clothes, only wearing her uniform at work. She was determined to make the transition, but she felt crushed. She would leave the military after 25 years, without having been deployed in wartime—without, she felt, having pulled her weight. She would leave incomplete. As Hepner saw it, Smith was exchanging one burden for another. On February 2, 2010, while Smith was at work at the Pentagon, Hepner went up to Capitol Hill, entered the marble-faced Dirksen Senate Office Building, and sat down in a hearing room packed with gay rights leaders. The nation's two top military officials—Secretary of Defense Robert Gates and Admiral Mike Mullen, the chairman of the Joint Chiefs of Staff—were scheduled to testify to the Senate Armed Services Committee about "don't ask, don't tell." Hepner wanted to see for herself how the military establishment would talk about a policy that was about to force her partner out of the military and end her career. Just a week earlier, President Obama had called for a repeal of "don't ask, don't tell" in his State of the Union address. Hepner listened carefully when Secretary Gates explained that the question was not whether to repeal the current law, but how to best prepare for it. Admiral Mullen expressed support for this position, but then struck a personal note. "No matter how I look at the issue, I cannot escape being troubled by the fact that we have in place a policy which forces young men and women to lie about who they are in order to defend their fellow citizens," he said. When Hepner heard these words, joy washed over her. Looking around, she noticed that people had tears in their eyes. At home later, Smith and Hepner got on the Internet and found a video of the testimony. When Smith listened to what the highest-ranking military officer had said publicly, she began to cry.This is the first time, she thought, that a senior leader says I'm okay the way I am being in the military. Admiral Mullen's testimony shifted her perspective. If this policy is going to be overturned, she told Hepner, I'll stay in. Smith rescinded her retirement and volunteered to deploy to Afghanistan. Her boss agreed on the condition that after her deployment she would put in her name for promotion—she was an outstanding officer, smart and dedicated, the kind of person the army needed. While deployed from December 2010 to October 2011, Smith served as chief of Army Reserve Affairs at Bagram Air Force Base, but also made trips throughout Afghanistan to check in on members of the Army Reserve. "I knew it was dangerous," she says, "but I wasn't afraid." As promised, Smith applied for promotion upon her return, and on May 9, 2012—eight months after the repeal of "don't ask, don't tell"—she found her name on a list issued by the secretary of defense announcing her promotion to general. Tammy Smith would be the first openly gay general in the United States Army and the first female flag officer to come out of the ROTC program at the University of Oregon. It's the Monday after Veterans Day, and Brigadier General Tammy Smith is looking at the photo gallery of flag officers in the ROTC building on the UO campus. Her own image is impossible to miss; it stands out among the photographs of elderly men. She can't help but feel amused. If one needed any more proof of how far a small-town girl can make it, this was it. Later, Smith talks to more than a dozen current ROTC cadets—many of them women—over breakfast burritos and orange juice. She's not here to lecture but to listen. "What's on your mind?" she asks the cadets. They tell her about branch choices and ask about her assignments. Hepner accompanies her. Two years ago this would not have been possible. Now, the situation could not feel more normal. As Smith and Hepner—who were married in Washington, D.C., on March 31, 2012—like to describe it, they are a military family that happens to be gay. Smith doesn't miss an opportunity to talk about the importance of family support in the military. Not when she's talking to cadets, and not when she gives the keynote speech later that day at the UO Veterans Day event at the Ford Alumni Center. "They are the unsung heroes: parents, partners, spouses, children, siblings," she says. "When a soldier goes to training or deploys, a piece of that family goes along with them." Smith also takes a moment to reflect on the values that institutions such as the army and the University of Oregon instill. "The U.S. military attracts a certain type of citizen: somebody who wants to live their life in line with a set of tangible values and who has a propensity to serve the nation," she says. "The University of Oregon also attracts a certain type of citizen. Someone whose love is leadership, inclusiveness, service, intellectual development, and balance." After the ceremony, Smith and Hepner gather with friends and family members at Track Town Pizza. Smith's father has come up from Oakland, and good friends have come down from Portland. Smith has changed into civilian clothes and Hepner has put on an Oregon sweater. As everybody gets seated, Hepner stands up to give a toast. "There are families you are born into, and there are families that come along the way," she says. "You are all family. Thank you for your support." 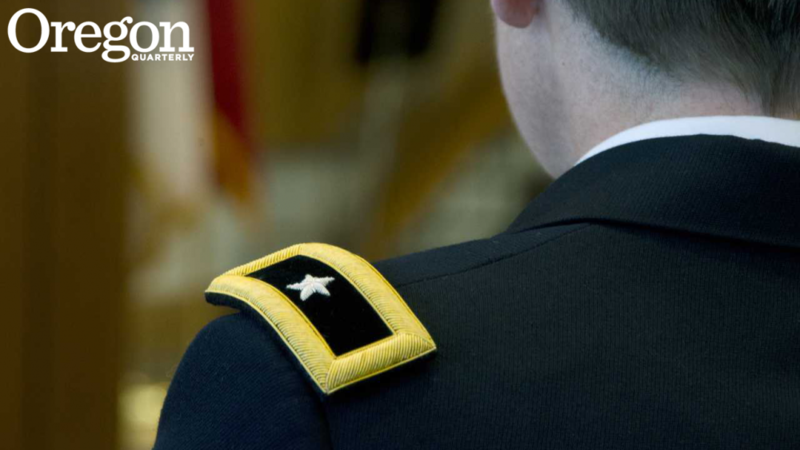 The Army Reserve Officer Training Corps (ROTC) is a college-based program that aims to recruit, retain, and develop cadets into future army leaders and prepare them for military service. The program at the University of Oregon was established shortly after the passage of the National Defense Act in 1916, and was mandatory for male freshmen and sophomores until 1962. During the Vietnam era, the presence of ROTC on many college campuses became controversial, and the UO was no exception. In January 1970, campus ROTC offices were vandalized, and when fire broke out in an ROTC storage area in Esslinger Hall, arson was suspected. The damage amounted to about $250,000. Nevertheless, the UO faculty voted to continue the program. For Lieutenant Colonel Lance Englet '94, professor and head of the Department of Military Science, ROTC combines the virtues of military service and the strengths of higher education. "The University of Oregon is such a great school when it comes to diversity," he says. "The degree that cadets are receiving here is helping them in this ever-changing and complex environment. Army leadership is adaptive." Currently, there are about 350 UO students participating in the program. More than 80 of them are contracted to serve in the army, the Army Reserve, or the National Guard once they graduate. The competition for scholarships is considerable, and not all qualified candidates can be accepted. Last year, the program commissioned 19 officers, continuing a tradition of ROTC alumni who have gone on to successful careers in the military. The University of Oregon has produced more flag officers—general officers of high enough rank to fly their own command flag—than any other nonmilitary university in the country. Brigadier General Tammy Smith is the 47th. Thomas Frank, MA '11, was a reporter for Kleine Zeitung, Austria's second-largest daily newspaper; Datum magazine; and the Austrian Broadcasting Corporation. He is currently pursuing a PhD in media studies at the University of Oregon.